For light relief I sometimes follow copyright issues, especially music piracy. So it was with great interest I came across this little tidbit from the European Commission’s institute for prospective technological studies. The good guys there analysed the clickstreams from 16,000 digital music consumers and concluded that a 10% increase in clicks on pirate music download sites leads to a corresponding 0.2% rise in clicks on legal download sites. Conversely, a 10% increase in clicks on legal streaming websites leads to up to a 0.7% increase in clicks on legal digital purchase websites. The difference in effect between legal and illegal sources on music sales is basically zero, they found. “Our results suggest that internet users do not view illegal downloading as a substitute for legal digital music,” say the researchers. Bottom line? The Pirate Bay, Megaupload etc were doing the music companies’ marketing for them. For free. It’s time to repeal the misbegotten Digital Economy Act, and lift the useless court-imposed ISP blocks on content. BT has inadvertently made the case for a national fibre to the premises roll-out. Today it announced it was delivering 10Gbps to a Cornish engineering company over that company’s 330Mbps fibre link between its office and the BT exchange in Truro. BT claims this is the fastest “retail” broadband link in the world, but it’s not connected directly to the public internet. Nothing on the internet presently works at that speed, it claims. Indeed, the computer and networking kit on either end of the link run slower than the fibre link. The deadline for Britain’s national next generation broadband service has slipped to 2017. This emerged the day after the European Commission agreed to approve the government’s controversial £1.5bn procurement plan after nearly nine months of argument. The previous Labour government had set a 2013 target for a universal 2Mbps service. The coalition soon changed that to “the best broadband network in Europe by 2015”. The deal negotiated by culture secretary Maria Miller a couple of weeks ago leaves Britain targeting a minimum 2Mbps universal service, with 90% of people having access to a 24Mbps service. On the same day that it announced its approval for the BDUK scheme, the commission approved a €2bn (£1.6bn) scheme to support rural areas in Bavaria, Germany. This plans a minimum 50Mbps network for “commercial and accumulation areas”. Neither DCMS, the government’s responsible department, nor the commission were prepared to give details of where the UK’s £1.5bn is coming from. The official statement says the amount is £530m. Pressed on this, the DCMS said the £1bn balance will be met by local authorities. It is unclear whether it includes £150m each for the Superconnected Cities initiative and the extension of mobile broadband to rural areas. However the commission said “EU funds” were part of the package. This detail may be included in the agreement between the government and the commission. A commission press release yesterday said that a redacted (censored) version of the agreement would be made public in due course. Commission sources say the British government is now making the cuts. It is unclear what will be kept secret. It is believed that Brussels was unconvinced by British claims that the resulting networks would provide “open access” on a “competitive” basis. This is because only BT and Fujitsu qualified as suppliers under the framework. The Cabinet Office later labeled Fujitsu “unreliable”, effectively blacklisting it. That gives the UK eight years’ breathing room. Well, not quite. Part of the deal is that DCMS will have to report to the commission on progress by March 2015. It is unclear what sanctions the EU can impose if the UK is behind target. That will probably be a issue for the next government. 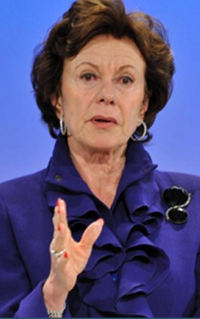 Europe’s Digital Agenda champion Neelie Kroes will condemn efforts to allow companies to stalk users online. Kroes believes delegates at the Web standards setting body W3C are in danger of kowtowing to mainly US lobbyists who say their cookies will refuse to acknowledge default Do Not Track (DNT) messages from browsers. UK users will disagree. They forced BT to abandon plans to use the Phorm ad-serving software after it was revealed to have conducted secret tests on users. Kroes is worried that consumers will start shopping off-line or find ways to hide their online movements rather than allow anonymous companies to track them through cyberspace. This could jeopardise the development of a single e-commerce market in Europe, one of the European Commission’s primary goals. In a December 2011 presentation Cisco said global retail e-commerce would be worth $1.4tr by 2015. The B2B market is already at least 50% bigger than retail, according to US Census figures quoted by Oracle earlier this year. But much of this is done on private networks with strong authentication with contractual obligations that create a climate of trust between parties. The DNT standard is meant to stop firms from installing third party tracking cookies without users’ explicit permission. At present firms can do this without telling users what data they collect or what they use it for, nor are users easily able to discover and delete what companies may find out or predict about them. This information is especially valuable to firms like Google and Facebook. They collate this data, compile a profile of users’ interests and therefore possible real world situation, and sell those profiles to advertisers who develop products (semi-)customised for individuals who fit that profile. The DAA claims this stops you from receiving unwanted marketing messages; critics say this would end up restricting all the information you would get to see and the product and service choices presented to you. The new provisions in Europe’s e-Privacy directive, the so-called “cookie rules”, require informed consent before information is stored or accessed on a user’s device, their computer or smartphone. This includes cookies for advertising or other tracking purposes. “All providers need to respect and implement these rules,” Kroes will insist. The Atlantic had a good piece on the prevalence of tracking in its February issue, and PCPro had a piece recently on how to avoid being tracked online. What are the hard costs and benefits of online surveillance? It is annoying to read, once again, reports that the coalition government, or at least certain civil servants, wants to reintroduce Labour’s shelved Interception Modernisation Programme (IMP), now in its new guise as the Communications Capabilities Development Programme (CCDP. Curiously, the story broke in the same week that Canada introduced a “Crime Bill” to permit surveillance, allegedly to give children the same online protection that others countries give, but which looks a lot like the IMP. Basically the law enforcement people want to be able to tap phones they way used to, but the change in technology to packet switching means this is hard to impossible. The initial cost of IMP was put at £12bn. This was mainly for the centralised GCHQ database, to be run by US outsource outfit EDS. This was to house all the emails, social network chit-chat, telephone calls, and especially voice over IP calls, that originate in or transit the UK. GCHQ then apparently opted for a £2bn pilot study. No-one outside the security establishment knows whether it worked, or to what extent it failed. The UK, and to be fair, most other countries, have been deluged with draconian surveillance legislation ever since the 9/11 terrorist attacks. In Britain, the Information Commissioner’s Office even produced a report that asked whether we were sleep-walking into a “surveillance state,” and answered its own question with a “yes”. Communications service providers like BT, Virgin Media, TalkTalk, Sky etc, are required under data retention laws to keep header information about the messages that transit their networks for a year. This information is essentially the same as one might find on a postal letter: name and address of sender and receiver, and the time of sending. NOT the contents. Or at least, not yet. The data retention laws are supported by the Regulation of Investigatory Powers Act 2000 (RIPA). Under RIPA warrants to intercept messages (i.e. the entire communication) must be signed by a secretary of state of a Scottish minister. “The authorisation can only be given in the interests of national security, for the purpose of preventing or detecting serious crime or for the purpose of safeguarding the economic well-being of the United Kingdom,” the Interception of Communications Commissioner (ICC) says in his 2010 annual report. In 2010 the Home Secretary signed 1,682 warrants, and there were 1,048 still in force at the end of the year, a 10% rise over 2009. Scottish ministers approved 183 warrants, down from 204 in 2008, leaving 46 still in force at the end of the year a 5% rise from 2008. The ICC does not report how many requests were refused. RIPA also allows hundreds of thousands of civil servants to request communications data (i.e. the “envelope information”). And they do. Those allowed include the intelligence agencies, police forces, the United Kingdom Border Agency (UKBA), the Serious Organised Crime Agency (SOCA) and other public authorities such as the Gambling Commission, Financial Services Authority (FSA) and local authorities. The ICC’s annual report for 2010 says there were 552,550 requests for communications data for that year. This was up from 525,130 and 504,173 in the two preceding years respectively. Some 65% were to find out who owns a mobile phone. In the light of investigations into police corruption allied to mobile phone hacking, that may cause some concern. There is without doubt a terrorist threat: the 7/7 London bombs show that. But with the death of Osama bin Laden and the apparently destruction of of Al-Queda, what threats remain? One would not like to think that the entire panoply of anti-terrorist measures are to be used to fight RnB music pirates, as SOCA did this week. The fact remains that this entire area is virtually evidence-free, certainly with regard to costs and benefits. One imagines that MI6 could buy an awful lot of human intelligence with £12bn, without affecting the law-abiding majority of the population. These are the questions I would like to see answered and debated in public. What evidence must the authorities produce for minister to grant a warrant to permit surveillance? How can ministers test it before they grant the warrant? How many warrants does the government expect to issue a year? Under what circumstances will the evidence gathered from surveillance be permitted in court? How do the investigators account for IP spoofing, for temporary IP address assignments, for TOR’ed messages and for encrypted messages? Who bears the cost of collecting, storing and accessing communications data? What is the budget for the collection, storage, retrieval and subsequent processing of this data? What protections and sources of restitution are there for people falsely identified and investigated? What estimates are there of the number of residents who buy or sell pornographic images of children? How many convictions have been secured in the past five years in which evidence gathered using surveillance laws, particularly intercept and communications data, proved conclusive to the prosecution? What is the split between convictions related to terrorism and to economic crime (including smuggling)? What’s in Google’s new privacy rules for you? What about the new EU idea about the right to be forgotten, or the old one, to have multiple online personalities? Google says doing what it wants with your (or my) online record will result in a better search experience for the billions of people who use it daily. What’s in it for Google is clearly more billions of advertising money. So what’s in it for you and me? Well, Google didn’t know, or at least it doesn’t provide the answer in the first page of search results. I prefer to have a disaggregated identity when I’m online. In other words, I like the anonymity that goes with being a dog, unless I explicitly make my identity (and my preferences) available. I don’t think Google or anyone else should be messing with that. Neither does Mirjam Remie, who writes for Bits of Freedom, a Dutch website. She’s trying to live Google-free for a week. Here are some of the alternative tools to Google’s she says she may be using, in case you’d like to try them too. The 22 European states that signed up to the controversial Anti-counterfeiting Trade Agreement (Acta) last week may have been in an unseemly rush. They appear to have ignored the recommendation that the European Parliament (EP) postpones ratification of the US-inspired agreement on at least two grounds: firstly, because it does not comply with existing European rules and agreements (acquis) as it stands, and secondly, because the European Court of Justice has not had a chance to evaluate the method for calculating financial damages for copyright infringements. The haste with which the UK and 21 others joined the US, Australia, Canada, Japan, Mexico, Morocco, New Zealand, Singapore, South Korea and Switzerland may also have led to the resignation of Kader Amir, the Acta rapporteur. Amir was responsible for shepherding the agreement through the EP ratification process, scheduled for June. He quit on the day of the signing, describing the process as a “masquerade“. The authors found plenty that disturbed them. Some of it may be why Germany, the Netherlands, Estonia, Cyprus and Slovakia did not sign up. They also said it was “difficult to point to any significant advantages that Acta provides for EU citizens beyond the existing international framework”. “The apparent lack of intent to seek congressional approval and thus actually implement the treaty in US law begs the question of what, if anything, the EU gained from the US. There are serious concerns regarding whether Acta will have any effect under US law and thus be able to be treated as a treaty under international law,” the authors said. They added that the exclusion of China, India and Brazil (which were apparently not invited to the secret negotiations and which have all raised questions over Acta) meant that major competitors to the EU are not bound by its provisions. The authors said the EU had won one concession, that Acta signatories would act against faked geographic indicators (GIs). GIs cover brands like Parma ham and Champagne. But counties that do not already protect GIs are not bound by Acta. This exempts the US, Australia, Japan and South Korea, the study said. The authors found that proposed measures on copyright piracy seen in early leaked documents published on WikiLeaks had been watered down. However, the proposed financial penalties go further than existing EU and international agreements. This would appear to nail websites like The Pirate Bay and MegaUpload. These pointed to sites that held infringing material, even though they did not host it themselves. Both have been shut down using other laws. But it could include search engines such as Google, which index and point to sites that host infringing material. Google is clearly the focus of a secret document, now public after a Open Rights Group Freedom of Information request, that calls for search engines to delist sites that hold infringing material. Acta provides for judicial authorities to order four types of financial penalties: for the infringer to pay his profits to the rightsholder, to pay pre-established damages, or a presumption of the harm caused by the infringement, or additional damages. The list of measures to be taken into account when assessing damages contains “two novel approaches that are problematic” and not in the existing rules. These are the market price of infringing goods, based on the concept that each infringing product constitutes a lost sale; and the suggested retail price, which they describe as “another proxy for the concept that each infringing product represents a lost sale”. The authors noted that rightsholders could allege copyright infringements to prevent competitors indefinitely from entering markets. This could include makers of generic drugs (drugs that are out of patent protection), but only in signatories’ markets. Acta also excluded copying for personal, no-for-profit uses, including “fair use” for study, teaching, new reporting, commentary or criticism, they said. It also sought to criminalise unauthorised copying by anyone. “(Acta’s) criminal measures (are) most problematic in the field of copyright and related rights, as these cover not only economic actors, but address private individuals in equal measure,” they said. The authors accepted that it is important to protect intellectual property, but added that “knowledge” has a sell-by date. They raised questions over who stands to benefit from such protection. The said countries with more established knowledge-based capabilities (ie research-intensive manufacturers, pharmaceuticals, software, or creative products such as music, films, etc) will benefit, not least through enforcement. “Countries with weaker knowledge-based capabilities are likely to benefit most by being outside such an international system, so they can freely exploit and imitate IP-related products in their own domestic economies,” the authors say. From the start Acta has aimed to further the interests of the US music and film industry, almost exclusively. It has been negotiated in secret, with US president Barack Obama stating at one point that it was a US national secret. It does nothing to enhance protections the EU has already secured in public forums, and may severely curtail the ability and capacity for its people to use what is already published for legitimate ends. Rejecting ratification means that the EU writes off the cost of the negotiations, and possibly some political capital. Accepting it lock, stock and barrel potentially exposes EU citizens to unquantifiable criminal and financial penalties for an indefinite period, while allowing its main economic competitors free reign. If you were an MEP, what would you do?